Elmo's Eatery is the current name of a restaurant in Sesame Place. When the park opened it was called The Sesame Food Factory. The restaurant still has many of the design elements that were there on opening day. Gone are the glass walls separating the customers from the kitchen, but the area is still open and kids can watch food prepared right in front of them. He has been removed recently. 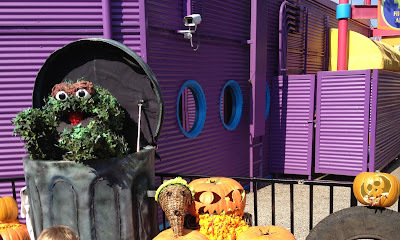 The topiary showed up (in a different can) outside the First Aid station at Halloween time as part of a Halloween display. Currently the area is decorated for Christmas and Oscar hasn't returned.